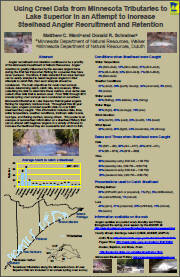 Please feel free to submit any articles or stories related to North Shore Steelhead fishing. Phenomenal!! This site never disappoints. Being a data-head myself, I know putting these things together is not easy. Just wanted to thank you and say that the info on this site is top-notch. I read a lot about fishing and rarely do I come across articles as insightful/useful as the ones here. Steelhead data you should have!